For other people named Mark Kelly, see Mark Kelly (disambiguation). Mark Edward Kelly (born February 21, 1964) is an American astronaut, engineer, and U.S. Navy captain. He also is an author, political activist, as well as aerospace executive and consultant. Kelly is the husband of former U.S. Representative Gabrielle Giffords. A naval aviator, he flew combat missions during the Gulf War. He was selected to become a NASA Space Shuttle pilot in 1996 and flew his first mission in 2001 as pilot of STS-108. He piloted STS-121 in 2006 and commanded STS-124 in 2008 and STS-134 in 2011. STS-134 was his final mission and the final mission of Space Shuttle Endeavour. His wife was shot in an attempted assassination in Tucson, Arizona, on January 8, 2011, suffering serious injury to her brain. After the shooting, in which six people were killed, both Kelly and Giffords were thrust into the media spotlight. His wife's shooting led to a broad national conversation ranging from the duties of a husband to what is acceptable civil discourse. Kelly's identical twin, Scott Kelly, is also an astronaut. The Kelly brothers are the only known siblings to have both traveled in space. In 2015, Scott Kelly began a mission spending a year in space on the International Space Station. He returned to Earth on March 1, 2016, after 340 days in space. During and after Scott's year-long mission, the brothers were studied to find physical differences caused by living in space versus a baseline on Earth. On February 12, 2019, Kelly launched his campaign for the 2020 United States Senate special election in Arizona, running as a Democrat. He hopes to win the Senate seat currently held by another combat veteran, Republican Martha McSally. Mark Edward Kelly is the son of Richard and Patricia (McAvoy) Kelly, two retired police officers. Kelly is of Irish descent. He was born on February 21, 1964, in Orange, New Jersey, and raised in West Orange, New Jersey. Kelly graduated from Mountain High School in 1982. He received a bachelor of science degree in marine engineering and nautical science from the United States Merchant Marine Academy, graduating with highest honors in 1986. In 1994, he received a master of science degree in aeronautical engineering from the U.S. Naval Postgraduate School. In December 1987, Kelly became a naval aviator and received initial training on the A-6E Intruder attack aircraft. He was then assigned to Attack Squadron 115 (VA-115) in Atsugi, Japan, and made two deployments to the Persian Gulf on the aircraft carrier USS Midway, flying 39 combat missions in Operation Desert Storm. After receiving his master's degree, he attended the U.S. Naval Test Pilot School from June 1993 to June 1994. He has logged more than 5,000 hours in more than 50 different aircraft and has over 375 carrier landings. He is the recipient of these awards: two Defense Superior Service Medals; one Legion of Merit; two Distinguished Flying Crosses; four Air Medals (two individual/two strike flight) with Combat "V"; two Navy Commendation Medals, (one with combat "V"); one Navy Achievement Medal; two Southwest Asia Service Medals; one Navy Expeditionary Medal; two Sea Service Deployment Ribbons; a NASA Distinguished Service Medal; and an Overseas Service Ribbon. On June 21, 2011, Kelly announced his retirement from the U.S. Navy and NASA, effective October 1, 2011. His retirement was announced on his Facebook page, where he wrote, "Words cannot convey my deep gratitude for the opportunities I have been given to serve our great nation. From the day I entered the United States Merchant Marine Academy in the summer of 1982 to the moment I landed the Space Shuttle Endeavour three weeks ago, it has been my privilege to advance the ideals that define the United States of America." Mark Kelly and his brother Scott were both selected to be Space Shuttle pilots by NASA in 1996. They joined the NASA Astronaut Corps in August of that year. Mark Kelly has logged over 54 days in space. The Space Shuttle's a very complex machine. It's got a lot of moving parts that move and operate at pretty much the limit of what we've been able to engineer. Spaceflight is risky. I think with regards to the tank, we've reduced some of the risk there. We've changed the design a little bit and we've made some pretty big strides in trying to get foam not to shed from the tank anymore. So there is some risk reduction there and I guess overall the risk is probably a little less. But this is a risky business, but it's got a big reward. Everybody on board Discovery and the space station here thinks it's worthwhile. Kelly's first trip into space was as pilot of STS-108. After several delays, Endeavour lifted off on December 5, 2001, on the final Shuttle mission of 2001. STS-108 Endeavour visited the ISS, delivering over three tons of equipment, supplies, and a fresh crew to the orbiting outpost. The hatches were opened between Endeavour and the ISS Destiny Laboratory on December 7, enabling the 10 crew members to greet one another. The Expedition 3 crew officially ended their 117-day residency on board the ISS on December 8 as their custom Soyuz seat-liners were transferred to Endeavour for the return trip home. The transfer of the Expedition 4 seat-liners to the Soyuz return vehicle attached to the station marked the official exchange of crews. Kelly and Mission Specialist Linda Godwin used the shuttle's robotic arm to lift the Raffaello Multi-Purpose Logistics Module from the shuttle payload bay and attach it to a berth on the station's Unity node. The crews began unloading supplies the same day. Mission managers extended Endeavour's flight duration to 12 days to allow the crew to assist with additional maintenance tasks on the station, including work on a treadmill and replacing a failed compressor in one of the air conditioners in the Zvezda Service Module. A change of command ceremony took place on December 13 as Expedition 3 ended and Expedition 4 began. STS-108 returned to Earth with the previous ISS crew of three men. Kelly traveled over 4.8 million miles and orbited the Earth 186 times over 11 days and 19+ hours. In July 2006, Kelly served as pilot for STS-121 Discovery, the second "Return to Flight" mission following the loss of Columbia in February 2003. Because of weather delays, STS-121 became the first shuttle mission to launch on the Fourth of July. The main purposes of the mission were to test new safety and repair techniques introduced following the Columbia disaster and to deliver supplies, equipment, and European Space Agency (ESA) astronaut Thomas Reiter from Germany to the ISS. The transfer of Reiter to the ISS returned the station to a three crew-member staffing level. During the STS-121 mission to the ISS, the crew of Discovery continued to test new equipment and procedures for the inspection and repair of the thermal protection system that is designed to increase the safety of the shuttles. It also delivered more supplies and cargo for future ISS expansion. After the Columbia accident, NASA decided that two test flights would be required and that activities that were originally assigned to STS-114 would need to be divided into two missions because of the addition of post-Columbia safety tests. Gabrielle Giffords, Kelly's girlfriend at the time, picked one of the wake-up songs for the mission: "Beautiful Day" by U2. Kelly traveled over 5.28 million miles and orbited the Earth 202 times over 12 days and 18+ hours. My first two flights I was the pilot. Being the commander is different in that you're responsible for the overall mission. ... You have to worry about the whole thing, the training drill your other crew members are getting, mission success, and mission safety. So it is a more comprehensive job and requires more time. I'm really a little bit surprised at how much more there is to it. But I think it's more rewarding as well. The mission was the second of three Shuttle missions to carry components of Japan's Kibo laboratory to the ISS. Kibo means hope in Japanese. The laboratory is Japan's primary contribution to the ISS. Just prior to liftoff, Kelly said: "While we've all prepared for this event today, the discoveries from Kibo will definitely offer hope for tomorrow. Now stand by for the greatest show on Earth." During the launch, Launch Pad 39A sustained substantial damage, more than had been seen on any previous launch. Following liftoff, inspectors discovered that bricks and mortar from the launch pad's base had been thrown as far as the perimeter fence, a distance of 1,500 feet (457 m). Kelly and his crew delivered the pressurized module for Kibo to the ISS. The module is the largest component of the Kibo laboratory and the station's largest habitable module. Discovery also delivered Kibo's Remote Manipulator System. Perhaps the most important part they delivered was a replacement part for the station's toilet. The single toilet on the ISS had been malfunctioning for a week, creating a potentially serious problem for the crew. When Kelly first entered the station, he joked, "You looking for a plumber? ", referring to the broken toilet. This mission marked the first time a spouse of a member of the U.S. Congress traveled to space. Kelly traveled over 5.7 million miles, and orbited the Earth 218 times over 13 days and 18 hours. STS-134 launched on May 16, 2011. On April 29, 2011, the first launch attempt of STS-134 was scrubbed. Kelly's wife, Gabrielle Giffords, traveled to Florida on her first trip since moving from Tucson to Houston in January after an attempted assassination. Giffords' appearance at Kennedy Space Center gave the launch a high profile, "one of the most anticipated in years," according to The New York Times. President Obama visited the Kennedy Space Center on April 29 on a trip with the original intention of watching the Endeavour launch. Kelly was the commander of the mission which was Space Shuttle Endeavour's last. His crew and he delivered the Alpha Magnetic Spectrometer to the ISS. Most of the mission's delays were caused by external tank issues on STS-133 Discovery. When Mark's twin brother Scott Kelly went to the ISS on October 7, 2010, STS-134 was scheduled to go to the station during Scott's mission. The potential rendezvous in space of the Kelly brothers would have been a first meeting of blood relatives in space. The delay of the launch of STS-134 ended the possibility of that happening. After the shooting of his wife, his status as commander of STS-134 was unclear, but NASA announced on February 4, 2011, that Kelly would remain as commander of the mission. The remarkable progress his wife was making in her recovery helped Kelly make the decision to return to training. Peggy Whitson, chief of the NASA Astronaut Office at the time, stated "we are confident in his ability to successfully lead this mission, and I know I speak for all of NASA in saying 'welcome back.'" At 4 pm PDT on May 22, the European Space Agency and Italian Space Agency arranged for a call to Endeavour by Pope Benedict XVI. During his call—prompted by the discovery of a gash in the Shuttle's fuselage—the Pope extended his blessing to Kelly's wife, Giffords, who had undergone skull surgery earlier in the week. The event marked the first time a pope spoke to astronauts during the course of a mission. On June 24, 2011, a recorded message by Kelly from the ISS wished his wife love using song lyrics from David Bowie's "Space Oddity" and introduced U2's song "Beautiful Day" on the first night of the Glastonbury festival in England. A similar message from Kelly aboard the ISS was played during U2's 360° Tour concert stop at various locations. He says: "I'm looking forward to coming home. Tell my wife I love her very much, she knows." On June 21, 2011, Kelly announced that he would be leaving NASA's astronaut corps and the U.S. Navy effective October 1. He cited the needs of his wife during her recovery as a reason for his retirement. In 2011, he coauthored Gabby: A Story of Courage, Love and Resilience, with his wife. The book provides biographical information on the couple and describes in detail the assassination attempt on Gabby and her initial recovery. Written in Kelly's voice, it includes a short note by Giffords at the end. Kelly's second book, Mousetronaut: Based on a (Partially) True Story, is a children's book that was released in 2012. Illustrated by C. F. Payne. It was a New York Times number one bestseller. This was followed by a sequel the next year, Mousetronaut Goes to Mars. Giffords and Kelly co-authored Enough: Our Fight to Keep America Safe from Gun Violence in 2014. In 2015, Kelly co-wrote with Martha Freeman Astrotwins: Project Blastoff, a fictional story about twins Scott and Mark who build a space capsule in their grandpa's backyard and try to send the first kid into orbit. He dedicated this book to his real twin brother, astronaut Scott Kelly. The sequel, Astrotwins - Project Rescue, was published in 2016. Kelly is co-founder and strategic advisor of Tucson-based near-space exploration company World View Enterprises. On March 28, 2012, SpaceX announced that Mark Kelly would be part of an independent safety advisory panel composed of leading human spaceflight safety experts. In January 2013, Kelly and Giffords started a political action committee called Americans for Responsible Solutions. The mission of the organization is to promote solutions with elected officials and the general public. The couple states that it supports the Second Amendment while promoting responsible gun ownership and "keeping guns out of the hands of dangerous people like criminals, terrorists, and the mentally ill." Current gun laws allow for private sellers to legally sell guns without a background check, creating a loophole that provides criminals and the mentally ill easy access to guns. Kelly said on Fox News on March 31, 2013, that "any bill that does not include a universal background check is a mistake, It's the most common sense thing we can do to prevent criminals and the mentally ill from having access to weapons." In 2016, the Americans for Responsible Solutions joined the Law Center to Prevent Gun Violence and launched a joint organization known as Giffords. Kelly is also an active public speaker, and gives many lectures together with his brother. On February 12, 2019, Kelly announced that he will run as a Democrat for the 2020 United States Senate special election in Arizona. He hopes to win the Senate seat currently held by another combat veteran, Republican Martha McSally. A Trump supporter and anti-abortion candidate, she was appointed to the seat shortly after losing the election to succeed Jeff Flake, that having been won by Democrat Kyrsten Sinema, and upon the subsequent resignation of the previous Republican gubernatorial appointee, Jon Kyl. McSally is the presumptive Republican nominee for the 2020 election to serve the final two years of the term won by the late John McCain, who was elected in 2016 and died in 2018. Kelly married Amelia Victoria Babis on January 7, 1989. They divorced in 2004. They have two daughters, Claudia and Claire Kelly. Kelly married U.S. Congresswoman Gabby Giffords of Tucson, Arizona, on November 10, 2007, in a ceremony presided over by Rabbi Stephanie Aaron, and attended by his STS-124 shuttle crew and former Secretary of Labor Robert Reich. Reich toasted: "To a bride who moves at a velocity that exceeds that of anyone else in Washington, and a groom who moves at a velocity that exceeds 17,000 miles per hour." The couple met on a 2003 trip to China as part of a trade mission sponsored by the National Committee on U.S.–China Relations. At the time, he lived in Houston. At the time of their marriage, Kelly said that the longest period of time the two had spent together in one stretch was a couple of weeks. He said that they did not plan to always live that way, but that is what they were used to. He added, "It teaches you not to sweat the small stuff." Kelly's wife, Representative Gabrielle Giffords, was shot in an assassination attempt on January 8, 2011, putting Kelly in the national spotlight. On February 4, Kelly described the previous month as the hardest time of his life; and he expressed his gratitude for the enormous outpouring of support, good wishes and prayers for his wife. He said that he believed people praying for her helped. Kelly received word that his wife had been shot from an aide of the Congresswoman almost immediately after the shooting. He flew from Houston to Tucson with members of his family. While en route, the Kellys received an erroneous news report that Giffords had died. "The kids, Claudia and Claire, started crying. My mother, she almost screamed. I just walked into the bathroom, and, you know, broke down." Calling family in Tucson, Kelly found out that the report was false and that she was alive and in surgery. "It was a terrible mistake," Kelly said, "as bad as it was that she had died, it's equally exciting that she hadn't." From the time he arrived in Tucson, Kelly sat vigil at his wife's bedside as she struggled to survive and began to recover. As her condition began to improve, the Kelly-Giffords family researched options for rehabilitation facilities and chose one in Houston. On January 21, Giffords was transferred to the Memorial Hermann–Texas Medical Center, where she spent five days prior to moving to TIRR Memorial Hermann, where she continued her recovery and rehabilitation. Giffords and her husband had spoken dozens of times about how risky her job was. She was afraid that someone would come up to her at a public event with a gun. In an interview filmed just over a week after the shooting, Kelly said, "She has Tombstone, Arizona, in her district, the town that's too tough to die. Gabrielle Giffords is too tough to let this beat her." A memorial service for those killed was held on January 12, 2011, at the University of Arizona. President Barack Obama flew to Tucson to speak at the memorial. Kelly sat between First Lady Michelle Obama and Secretary of Homeland Security Janet Napolitano, the previous governor of Arizona. At the end of the service, President Obama consoled and embraced him, after which Kelly returned to the hospital to be with his wife. In the name of God, our God of Israel, may Michael, God's angel messenger of compassion, watch over your right side. May Gabriel, God's angel messenger of strength and courage, be on your left. And before you, guiding your path, Uriel, God's angel of light and behind you, supporting you, stands Raphael, God's angel of healing. And over your head, surrounding you, is the presence of the Divine. Kelly believes that there is now a chance to change a political environment he thinks is filled with far too much vitriol. He hoped that the tragedy would also be an opportunity to improve the tone of our national dialogue and cool down the rhetoric. In response to a question on February 4, regarding the discussions about civility in politics Kelly said: "I haven't spent a lot of time following that, but I think that with something that was so horrible and so negative, and the fact that six people lost their lives including a nine-year-old girl, a federal judge, Gabby's staff member Gabe—who was like a younger brother to her—it's really really a sad situation. I am hopeful that something positive can come out of it. I think that will happen, so those are good things." ^ a b "Commander Mark Kelly Announces Retirement From NASA, Navy". Fox News. June 21, 2011. Retrieved July 4, 2011. ^ Sunseri, Gina (June 1, 2011). "Space Shuttle Endeavour Lands Safely in Florida". ABC News. Retrieved August 1, 2011. ^ Tolson, Mike (January 17, 2011). "Their toughest mission yet, Shooting of Gabrielle Giffords thrusts her husband and brother-in-law, both astronauts, into an unfamiliar spotlight". Houston Chronicle. Retrieved February 9, 2011. ^ Barry, Dan (February 4, 2011). "Public Drawn to Choice by Giffords's Husband". The New York Times. Retrieved February 9, 2011. ^ "WebCite query result". www.webcitation.org. Archived from the original on March 27, 2015. Retrieved November 7, 2017. ^ "Twin astronauts prep for year-long mission". Retrieved November 7, 2017. ^ Cruikshank, Jeffrey L.; Kline, Chloë G. (2008). In peace and war: a history of the U.S. Merchant Marine Academy at Kings Point. John Wiley and Sons. p. 530. ISBN 978-0-470-13601-0. Retrieved March 4, 2011. ^ Lehren, Marilyn (January 8, 2011). "Rep. Gabrielle Giffords is married to West Orange native Mark Kelly". The Caldwells Patch. Archived from the original on July 15, 2011. Retrieved February 8, 2011. ^ "Kelly named among top 100 Irish Americans by Irish America/Irish Central". Gabrielle Giffords. June 2, 2011. Retrieved September 5, 2016. ^ a b c d e f g "Biographical Data: Mark E. Kelly (Captain, USN)". NASA. October 2009. Retrieved February 7, 2011. ^ "Astronaut Mark Kelly, husband of Gabrielle Giffords, retires from Navy". CNN. October 6, 2011. Retrieved October 6, 2011. ^ "Astronaut Mark Kelly announces his retirement – KTRK, ABC Channel 13, Houston, Texas". ^ "Transcript of Associated Press Interview via NASA". AP and NASA. July 11, 2006. Retrieved February 8, 2011. ^ a b c d "NASA Mission Archives, STS-108". NASA. Retrieved February 8, 2011. ^ Expedition 13 commander representing Russia's Federal Space Agency. ^ Boyle, Alan (July 4, 2006). "NASA counts down to 4th of July launch". MSNBC. Retrieved February 8, 2011. ^ a b "STS-121 Nasa Press Kit" (PDF). NASA. May 2006. Archived from the original (PDF) on July 23, 2006. Retrieved February 9, 2011. ^ a b c Anderson, Judith (December 2, 2007). "Gabrielle Giffords and Mark Kelly". The New York Times. Retrieved February 8, 2011. ^ Preflight Interview: Mark Kelly, Commander, NASA, April 29, 2008. ^ a b c "NASA Mission Summary, STS-124" (PDF). NASA. May 2008. Retrieved February 9, 2011. ^ Moskowitz, Clara (May 31, 2008). "Shuttle Discovery Launches Space Station's Largest Lab". Space.com. Retrieved February 8, 2011. ^ Moskowitz, Clara (June 2, 2008). "NASA Eyes Launch Pad Damage for Next Shuttle Flight". Space.com. Retrieved February 8, 2011. ^ a b Schwartz, John (June 15, 2008). "Shuttle Returns After 14-Day Mission". The New York Times. Retrieved February 8, 2011. ^ Faherty, John (June 1, 2008). "Congresswoman's husband now in orbit". The Arizona Republic. Retrieved February 8, 2011. ^ Nancy Atkinson (March 17, 2010). 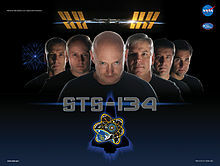 "STS-134 Does Star Trek with New Poster". universetoday.com. Retrieved August 14, 2010. ^ Henry Fountain (April 26, 2011). "In Endeavour's Final Act, the Supporting Cast Draws Outsize Attention". The New York Times. Retrieved April 26, 2011. ^ NASA Assigns Crew for STS-134 Shuttle Mission, Change to STS-132 NASA press release, August 11, 2009. Retrieved February 7, 2011. ^ Harwood, William (January 15, 2011). "Shuttle Discovery's lead spacewalker hurt in accident". Spaceflight Now. Retrieved February 8, 2011. ^ Dunn, Marcia (September 10, 2010). "Space double: Astronaut twins to join up in orbit". MSNBC. Retrieved February 9, 2011. ^ Dunn, Marcia (February 4, 2011). "Husband: Giffords would embrace flight decision". Associated Press. Retrieved February 8, 2011. ^ "NASA Astronaut Mark Kelly Resumes Training For STS-134 Mission". NASA Press release. February 4, 2011. Retrieved February 9, 2011. ^ "Pope blesses Endeavour astronauts by phone". San Francisco Chronicle. Associated Press. May 22, 2011. Retrieved May 22, 2011. ^ "Talk of His Holiness Benedict XVI with the Astronauts in Orbit". The Vatican. May 21, 2011. Retrieved August 4, 2018. ^ "NASA Commander Mark Kelly appears at U2 360° Tour in Seattle". Politics Down and Dirty blog. June 7, 2011. Retrieved August 28, 2011. ^ Giffords, Gabrielle; Kelly, Mark; Zaslow, Jeffrey (November 15, 2011). Gabby: A Story of Courage and Hope. Scribner. ISBN 978-1451661064. ^ Kelly, Mark (October 9, 2012). Mousetronaut: Based on a (Partially) True Story. Simon & Schuster/Paula Wiseman Books. ISBN 978-1442458246. ^ "Best Sellers". The New York Times. October 28, 2012. Retrieved March 28, 2013. ^ "Mousetronaut Goes to Mars by Mark Kelly, C. F. Payne". Barnesandnoble.com llc. Retrieved July 9, 2014. ^ Giffords, Gabrielle; Kelly, Mark (September 30, 2014). Enough: Our Fight to Keep America Safe from Gun Violence. Scribner. ISBN 978-1476750071. ^ Kelly, Mark; Freeman, Martha (March 17, 2015). Astrotwins: Project Blastoff. Simon & Schuster/Paula Wiseman Books. ISBN 978-1481415453. ^ Kelly, Mark; Freeman, Martha (March 1, 2016). Astrotwins: Project Rescue. Simon & Schuster/Paula Wiseman Books. ISBN 978-1481424585. ^ "World View:Our Team". Retrieved August 6, 2018. ^ "Industry Leaders Lend Expertise As Company Prepares for Astronaut Flight". Retrieved April 2, 2012. ^ Edwards-Levy, Ariel (April 3, 2013). "Mark Kelly: Background Checks Are Crucial, But NRA 'Right' On Mental Health Records". The Huffington Post. Retrieved April 3, 2013. ^ "About Giffords: History". Giffords. Retrieved August 6, 2018. ^ "Keppler Speakers, speaker profile". Keppler Speakers. February 2016. Retrieved February 11, 2016. ^ "Captains Mark and Scott Kelly". Keppler. Retrieved August 6, 2018. ^ , Washington Post, Kathleen Parker , January 1, 2019. Retrieved February 13, 2019. ^ Golodryga, Bianna; Alberto Orso; Kelly Hagan (January 11, 2011). 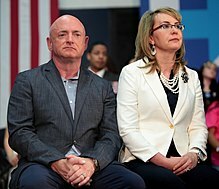 "Gabrielle Giffords Makes Strong Recovery as Husband Mark Kelly Keeps Vigil". ABC News. Retrieved February 9, 2011. ^ Shauk, Zain (January 25, 2011). "Gabrielle Giffords' husband considers shuttle flight". Houston Chronicle. Retrieved February 6, 2011. ^ Lacey, Marc; David M. Herszenhorn (January 9, 2011). "In Attack's Wake, Political Repercussions". The New York Times. Retrieved January 12, 2011. ^ "Giffords' husband says attempt on her life deepened his faith". Deccan Herald. February 4, 2011. Retrieved February 9, 2011. ^ a b "Kelly to Fly on Shuttle Mission". NASA TV. February 4, 2011. Retrieved February 6, 2011. ^ a b c Blackburn, Bradley (January 18, 2011). "Gabrielle Giffords' Husband Mark Kelly Says She Feared She Would Be Shot". ABC News. Retrieved February 8, 2011. ^ Stanglin, Douglas (January 21, 2011). "Giffords arrives in Houston to begin rehab". USA Today. Retrieved February 8, 2011. ^ "U.S. Rep. Giffords moved to TIRR Memorial Hermann". Associated Press. January 26, 2011. Archived from the original on March 11, 2012. Retrieved February 8, 2011. ^ Cooper, Helene (January 12, 2011). "Obama Calls for a New Era of Civility in U.S. Politics". The New York Times. Retrieved February 8, 2011. ^ a b Grossman, Cathy Lynn (February 4, 2011). "Mark Kelly finds God, angels after Tucson tragedy". USA Today. Retrieved February 8, 2011. Wikimedia Commons has media related to Mark E. Kelly.